At the news that Twitter was buying Posterous, it was only a matter of time before the end would be announced, so I started reevaluating another solution for blogging. I had written off Blogger for years since it was pretty primitive and lacked features that mattered to me. With the further integration of Google + and clients on most mobile devices, I decided to go Google and give it a try. Click on the "Request Backup" button next to the space you want to backup. Depending on the size of the blog this could take minutes or hours. My 200 post blog took about 10 min or so. When it is ready you will receive an email. Go back to http://posterous.com/#backup and click the download button to receive the zip file of your space. 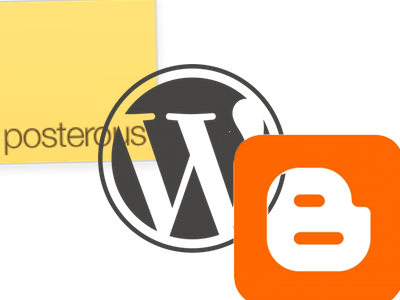 Although this appears to be in a format for Wordpress to import, the WordPress2Blogger tool will not work directly on this file. Follow the instructions to import. Once complete, go to Tools -> Export and export the xml file. Once complete, a file will download in the blogger format. Go to Settings -> Other and click on the "Import blog" link under "Blog tools". When I started to publish code on GitHub I began searching for the best way to share my code without accidentially giving away my keys, passcodes or usernames. I tried to fork a version for publishing but branch history will still allow the public to see what was in previous versions. After trying a few methods, I opted to store all my passcodes in a *.yml file in config folder and just add it to the .gitignore. This required a few notes to let cloners know what to do with the code in the case they were to use their own keys directly. In order to load ‘app_passwords.yml’ it needs to reside at the top of the ‘/config/initializers’ folder. I placed a file called ‘01_app_passwords.rb’ (I added the 01 to put it at the top of the file list since initializers are processed in order). Now that the passwords are loaded into the Rails envionment, they can be called from the controller. Now that the app’s sensitive data is located in a single place, the ‘app_passwords.yml’ can be added to your ‘.gitignore’ file and it will not be committed to GitHub (as long as you don’t have other commits to your code history). There are now two options for your README for letting users who download your code to change in order to use it with their own passwords. Change ‘MY_PASSWORDS['app_key’]‘ and 'MY_PASSWORDS['app_secret’] with their own keys and passwords. or…. Add their own ‘app_passwords.yml’ to the ‘/config’ folder.